When Honnold topped out at 9:28 A.M. on June 3, 2017, having spent fewer than four hours on his historic ascent, the world gave a collective gasp. The New York Times described it as "one of the great athletic feats of any kind, ever." 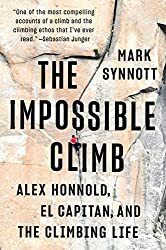 Synnott’s personal history of his own obsession with climbing since he was a teenager—through professional climbing triumphs and defeats, and the dilemmas they render—makes this a deeply reported, enchanting revelation about living life to the fullest. What are we doing if not an impossible climb? Synnott delves into a raggedy culture that emerged decades earlier during Yosemite’s Golden Age, when pioneering climbers like Royal Robbins and Warren Harding invented the sport that Honnold would turn on its ear. Painting an authentic, wry portrait of climbing history and profiling Yosemite heroes and the harlequin tribes of climbers known as the Stonemasters and the Stone Monkeys, Synnott weaves in his own experiences with poignant insight and wit: tensions burst on the mile-high northwest face of Pakistan’s Great Trango Tower; fellow climber Jimmy Chin miraculously persuades an official in the Borneo jungle to allow Honnold’s first foreign expedition, led by Synnott, to continue; armed bandits accost the same trio at the foot of a tower in the Chad desert . . . The Impossible Climb is an emotional drama driven by people exploring the limits of human potential and seeking a perfect, choreographed dance with nature.